​As chairman of Public Safety on Mansfield City Council, I know what it takes to keep our neighborhoods safe. As Mayor, I'll work to improve police and community relations and strengthen city outreach toward our residents. I'll work with small businesses, develop public investment opportunities and shape public policies that help create jobs. Moving Mansfield Forward is my priority. With your support we can make it happen. 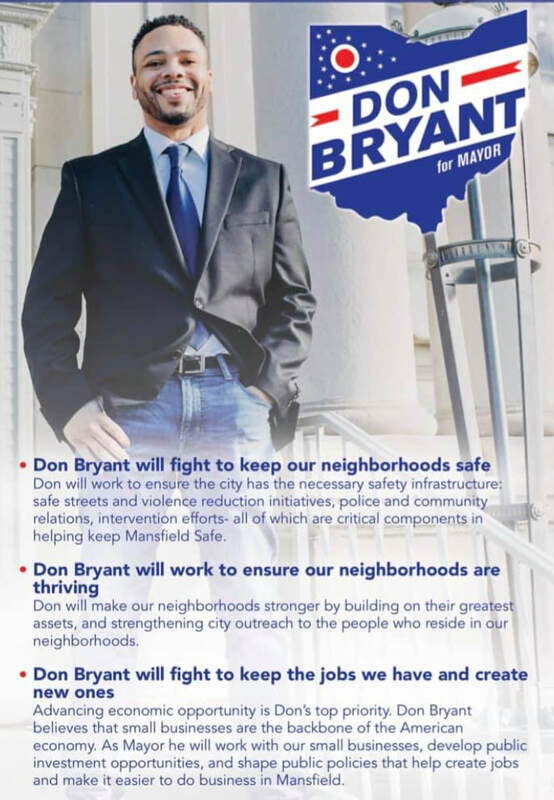 On Tuesday, May 7th, vote Don Bryant for Mayor of Mansfield. Support Team Bryant by making a contribution. Every dollar counts. Connect with Don on Facebook. Share ideas, comments, and more. Your voice matters to Don and to the entire Bryant for Mayor Team. Help Don rock the vote in Mansfield. Sign up for a volunteer shift and join the effort to Move Mansfield Forward. ​Authenticity matters. Don was born and raised in Mansfield, served in the community of Mansfield, and developed a career in Mansfield. The majority of Don's life has been building and strengthening relationships with Mansfielders. Experience matters. Don has local, state, and federal government experience. He developed a second career in education and holds elementary, middle, and high-school work experience, as well as experience in higher education. Don understand how to tackle tough issues. ​Passion matters. Don loves his hometown and the people who live in Mansfield. Moving Mansfield Forward is a must. It's time to create a new path forward.